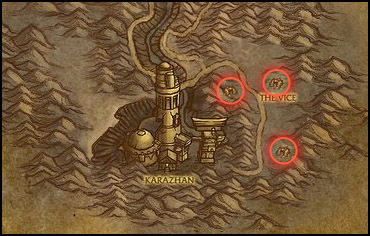 There are a few more profession gold making posts for MOP, but they won't be published in this blog. Let's return to normal gold tips that you can perform even today! This enchanting recipe is one of those that appear in VERY limited quantity. I'm currently playing on the second largest realm in the world, and in many weeks no one has been selling this enchant formula besides me, allowing me to make lots of gold off it! Deadwind Pass is quite dead, but at least there's one profitable mob to farm here! This is much like Crusader enchant farming, except Formula: Enchant Bracer - Superior Strength has a much higher drop rate and from my experience there's no competition either. This might have changed with the introduction of Cross Realm Zones, though. Enchant Bracer - Superior Strength drops from only one type of mobs, the Deadwind Warlocks in Deadwind Pass, around the subzone The Vice. It's a high 4% drop rate and you don't have to wait around too long to see them spawn again. The mobs are level 58 here, so it's an ideal farming spot if you're at the same levels, just before venturing into outland for the first time. Deadwind Warlocks spawn inside the marked caves only. They can spawn only in the caves that I've marked down on the map. There are other mobs spawning in the caves as well, so make sure to farm those too, since they sometimes spawn instead of a Deadwind Warlock. I've been selling both the Scrolls of this enchant and the Formula itself. Now this may change from realm to realm, but at least for me the Scrolls have been selling badly. But that may be the overpricing only. Formulae on the other hand sell better, but I have to be careful no to adjust the price too high even if I'm the only seller, which I always am. Does your Auction House look like this? If it does, then you have a chance to make some easy gold! Want the next gold tip to appear sooner? Just click on each of the share buttons on the left OR below and the next gold tip is here sooner! Awesome blog. ATM (thanks to this guide) I'm the only one with one of these in the AH (1st drop :D). What is a good all around price so I don't push it too high?